Meatballs sure seem to be a trend on Pinterest, especially Asian inspired recipes. I've come to the point now that I don't want to make a stir fry without a meatball in it! We've done Thai Chicken Meatballs, Sesame Soy Meatballs, our favorite Green Curry Meatballs, and last week, the Orange Chicken Meatballs from Just a Taste turned out fantastic. 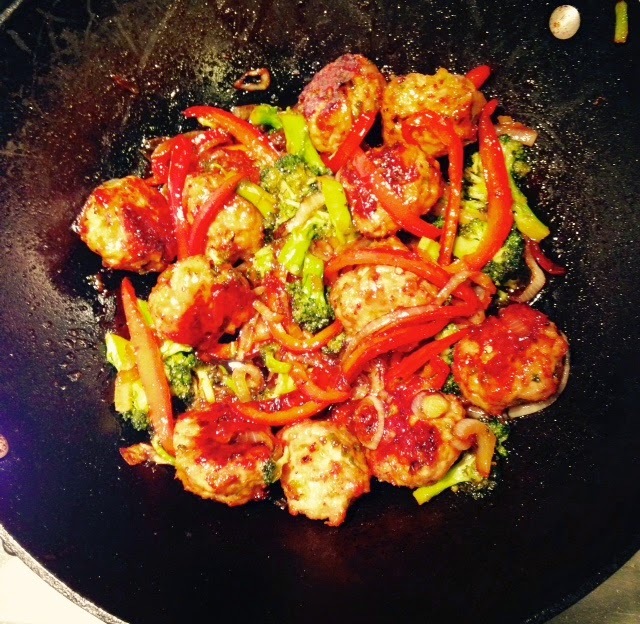 We stir fried broccoli, peppers and onion and threw the meatballs and sauce in at the end to coat everything, then served it over brown rice. Friday - taking the kids out to begin the birthday celebrating! Ill have to check out your burrito bow recipe i love Mexican food!